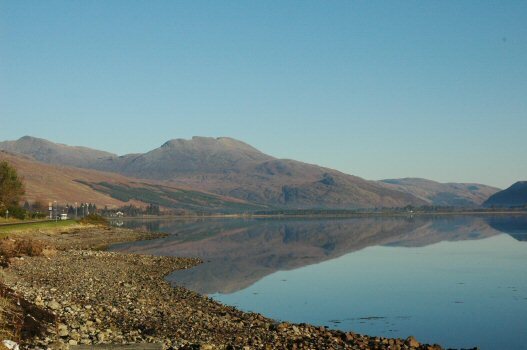 This page contains a number of photos and information for visitors to Lochcarron and the surrounding areas of Wester Ross, Lochalsh and the Isle of Skye, all of which are within easy reach of Lochcarron for days out. Please take the time to scroll down the page. 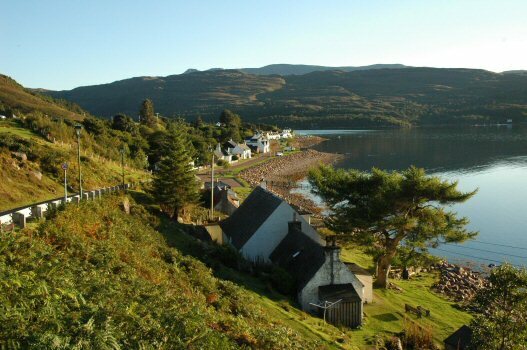 Lochcarron is situated on the West Coast of Scotland, 63 miles due west of Inverness, and lies amidst magnificent Highland scenery, some of the finest in the British Isles. It makes an excellent centre for touring Wester Ross as well as the Isle of Skye and Lochalsh, with many places to see, both in the near locality and further afield for day trips out. The view above shows Lochcarron village hugging the shoreline as seen from the viewpoint near Attadale on the south side of Loch Carron. The mountains of Applecross can be seen in the background. 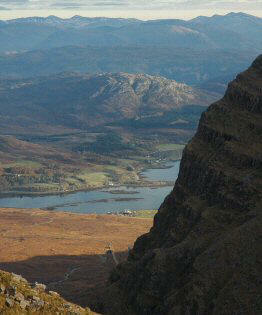 Both Applecross and Lochcarron have featured in "Monty Halls' Great Escape" series recently shown on BBC2 television. The view below shows Loch Carron as seen from the Main Street of the village where there is a small natural "harbour" for boats. To the immediate north and west lies the Applecross peninsula which is approached via the Bealach na Ba, the Pass of the Cattle, one of the highest roads in Britain. This road climbs from sea level to a height of 2,053 feet, and provides some spectacular views along the way. A 20-minute walk from the car park at the summit up to the TV relay station affords some even more magnificent views in all directions, especially towards the Isles of Skye and Raasay to the west. After negotiating the rugged high-level countryside on the approach to Applecross, one's arrival back at sea level gives the feeling of reaching a haven of peace and tranquillity. Applecross village is a very pretty little place, and there are some superb views across the Inner Sound to Raasay and Skye. 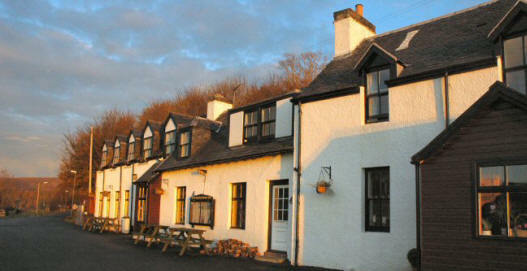 The photo below shows the Applecross Inn, a regular haunt of Monty Halls' during his stay at Beachcomber Cottage in Applecross, and well-known for its quality food, especially local seafood. As well as the Applecross Inn another popular venue for superb home-produced food at Applecross is the Applecross Walled Garden Restaurant (shown below). 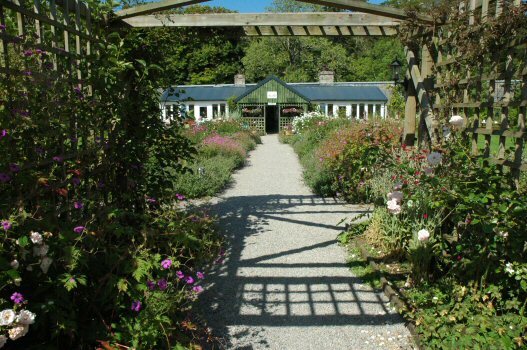 This is situated within a Victorian walled garden in which much of the produce used in the restaurant is grown. The restaurant specialises in locally sourced food: local beef, lamb and wild venison, free range eggs, wild mushrooms, locally caught fish and shellfish from sustainable fisheries. Just to the north of the Applecross peninsula is the picturesque little village of Shieldaig with its row of whitewashed cottages along the Main Street. Just out to sea is Shieldaig Island which is densely covered with mature Scots pine trees thought to have been planted in the 1800's with seeds derived from the Speyside area. 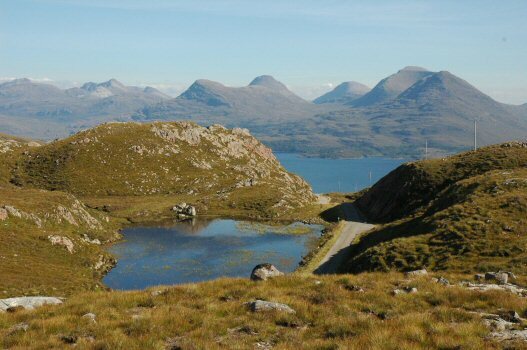 A little further north up the coast from Shieldaig one reaches Torridon, a favourite of hill walkers and climbers. 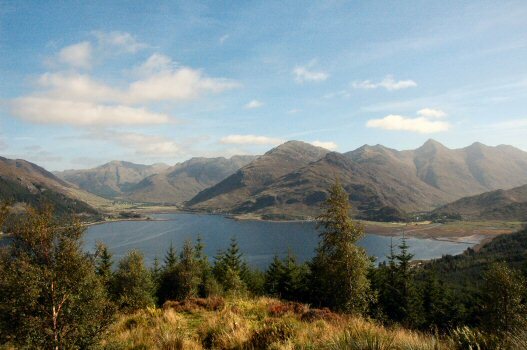 The area is dominated by the bulk of Liathach with other Munros such as Beinn Alligin and Beinn Eighe nearby. The latter gives its name to the first National Nature Reserve in the UK. 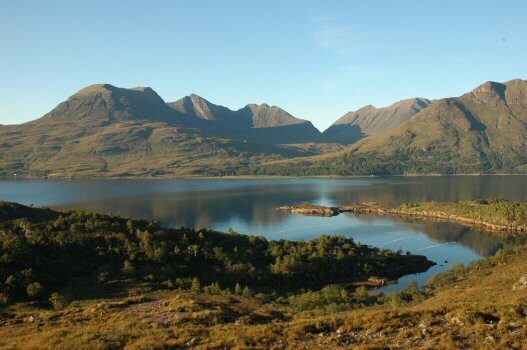 The photo below shows the view across Upper Loch Torridon looking towards Beinn Alligin. From the A896 at Torridon a little side road branches off for 9 miles to the village of Diabaig. This is another road with some dramatic views along the way and well worth making the detour. The photo below shows one of the superb views on this road. Travelling from Lochcarron to the south and west there are many places to see including Plockton, the setting for the Hamish MacBeth TV series a few years ago, and Eilean Donan Castle. A trip on the spectacular road over Mam Ratagan (see photo below) to Glenelg makes a superb day trip, where you can visit the ancient Pictish brochs and, if you are feeling energetic, walk down to Sandaig, the former home of Gavin Maxwell, author of "Ring of Bright Water". Also easily accessible for days out from Lochcarron is the Isle of Skye as the Skye Bridge (now toll-free!) is only just over 30 minutes' drive away from here. For those who prefer to leave the car and go walking or cycling, the possibilities are almost endless with numerous hill walks and hill tracks being found within the vicinity of Lochcarron and Glen Carron. 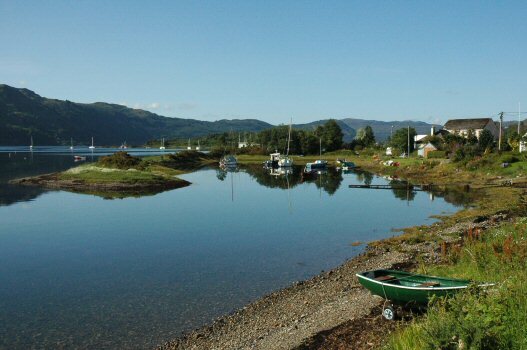 Loch Carron itself provides many opportunities for fishing, sailing (there is a sailing club to which visitors are welcome), canoeing and kayaking. You can even learn to dive and explore a whole new world beneath the surface of the water. If you are a golfer, Lochcarron has its own 9-hole golf course to which visitors are very welcome. The course has a superb lochside setting with magnificent views across the water. Sets of golf clubs are available to hire. The view above shows "Wellington", a well-known local landmark, otherwise known by its Gaelic name of Fuar Tholl. It's impossible in the space we have available to tell you everything there is to know about this lovely part of the British Isles, so why not come and stay and explore it for yourself? We are absolutely certain that you won't be disappointed!